A legend, a major influence, and a talent that can survive four decades, Ronnie Spector, former lead singer for the Ronettes, still has what it takes to write tremendous songs. Still as vibrant, potent, and creative as she always has been, her Kill Rock Stars American EP (released earlier in the UK on Creation Records) is proof that her talents will never fade and that her contributions to rock 'n' roll (on several occasions) are what help made rock 'n' roll what it is today. "She Talks To Rainbows" is an all-out, guitar-driven pop song with plenty kick to it. Written by Joey Ramone (who helped with production on the album), Spector's tender voice and colorful lyrics help give the song a gentle, easily accessible feel that warms the listener to the song while Joey's love for a good pop hook and pumping rock 'n' roll dazzles. And, you know, the hooks will find you deep in the midst of the song feeling every word and melody as they pass. "Don't Worry Baby," written by Brian Wilson (Beach Boys) for Ronnie Spector, is another powerful, impacting song that will almost floor you with the intense passion and love running through it. This is also the first time Spector has recorded this song; updating and putting her spin on it, she not only has you thinking of the Beach Boys sunny pop, but also of the happiness life has to offer. "You Can't Put Your Arms Around A Memory" starts off slow, with just a guitar and her voice, before a bounce is injected into the song when the chorus hits. Slow moving and contemplative, the song is perfect to sit back, rest your eyes, and enjoy life as Spector's words, and sincere hooks, captivate. The thoughts will run rapidly through your head as Spector paints pictures of life in your head as your own past memories come back to you. "Bye Bye Baby," the international number one hit which the Ronettes are probably most known for makes its way onto her new EP as she updates the song, dueting with Joey Ramone. The classics never get old and this song is proof of that. Fresh, intense, and sweet, Joey and Spector's voices play well together to give you even more reasons to love this song so much. Exclusive to the Kill Rock Stars release is a live recording of "I Wish I Never Saw the Sunshine," a bouncy, sweet pop song complete with a lush string accompaniment. This is rock 'n' roll that can make you get up and move, touches your heart, and still makes you want to sing along. 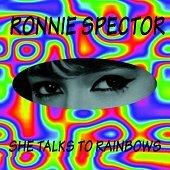 Ronnie Spector's latest EP may be a teaser for some, simply because it makes you crave more; I know after I finished this I craved more. Nonetheless, what we've got here is an intense, delightful collection of five songs, each one of them memorable and strong. Now, you can't ask for more than that. Not a hair out of place; I'll give it an A+.